The Decibel International Festival announces the lineup for their 9th annual festival in Seattle, on September 26 – 30, 2012. 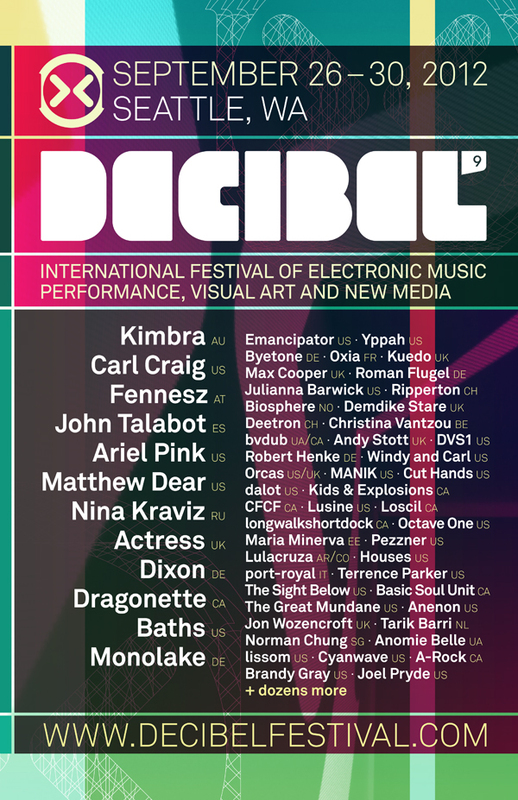 The 9th annual Decibel International Festival of Electronic Music Performance, Visual Art and New Media will feature headliners Kimbra, Carl Craig, Matthew Dear, Fennesz, John Talabot, Ariel Pink, and Actress, Nina Kraviz, and Baths. In addition to the headlining acts above, the festival will feature such heavy-hitters as Dragonette, Emancipator, and Yppah. Click here for the first 60 musical acts announced. Following the “artist a day” approach, the rest of the musical lineup (60 more acts out of 120) will be announced on June 27 with the entire program of educational programs, film festival, after-parties and boat-parties announced on July 11th. To reward attendees who purchase passes early, tickets will be discounted by 25% through June 26th. Please visit The Decibel Festival website for more information and to purchase tickets. In year nine, The Decibel International Festival of Electronic Music Performance, Visual Art and New Media is quickly becoming the SXSW of the swelling cultural phenomena that is electronic music. The Seattle based festival expects to hit 30k attendees this year with over 170 artists from 19 different countries, plus 72 educational speakers, making Decibel Festival an oracle for the growth of the entire international electronic music scene. The entire festival takes place over a five day period at over 14 venues in Seattle, Washington.